I have been intrigued by Indian cuisine ever sine my first visit to an Indian restaurant waaaaay back in university. So I was delighted (and a bit intimidated) when I was contacted by a member of the Pure Family to ask if I would be interested in reviewing the new English version of Papa Kazmi Pure Cookbook. I needn’t have been intimidated; it felt like Papa was right there with me while I was cooking! A big “Thank You!” to the Pure Family for providing me with the Papa Kazmi Pure Cookbook e-book. As always, opinions expressed here are my own. If you’re interested, you can read more about my disclosure policy. 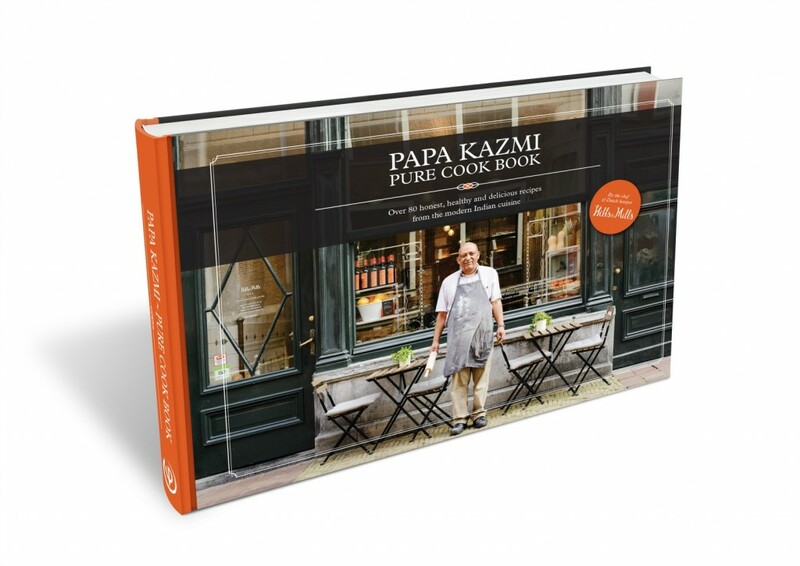 The Papa Kazmi Pure Cookbook is filled with fascinating stories about Papa and his family! As an immigrant to the Netherlands, I am always interested in how other immigrants have ended up here. Papa’s story in the Netherlands began similarly to my own – he fell in love with a young Dutch lady on the beach in Scheveningen, then moved here to be with her! There are five chapters in the Papa Kazmi Pure Cookbook, each dedicated to a theme: classic, day off, events, family and Hills & Mills. I found the page order in the e-book a bit odd at first until I realized that it was also a printed book, and meant to be seen two pages at a time. Once I figured that out, the layout made a whole lot more sense. Thankfully for me, one of those chapters is dedicated to the ingredients, complete with drawings of the raw herbs and spices, fruits, basic ingredients and special equipment needed for the recipes. I loved this addition, given my complete lack of knowledge of ingredients in Indian cuisine! I was pleasantly surprised to find that I was able to find nearly all of the ingredients at my local small-town grocery store. There were just three items I couldn’t find: cardamon pods, kalonji seeds, and rosewater. I ordered these online from Pit & Pit. I was also pleasantly surprised that Pit & Pit shipped everything wrapped only in paper, rather than plastic bubble wrap or styrofoam peanuts! While going through the book, I bookmarked no less than half of the recipes as ones I wanted to try! I narrowed down the list to these four; I couldn’t pick any fewer. Papa Kazmi’s Chai Tea was delicious! Now that I have all the ingredients, I will be making this regularly. The recipe calls for Assam tea, but I used some black tea that I already had. I used the main recipe, but there’s a long list of alterations to the spice mix that I would like to try. RB and I found the Aloo Kebab a little to peppery for our liking, but we loved the texture – the outsides were crispy and the insides soft and potato-y. I will absolutely make these again with just a bit less pepper. I was most nervous about making the Chicken Korma and Naan, but it was the one that I was happiest with in the end. It couldn’t have been better! The Raw Coconut Chia Kheer was such an easy little vegan dessert to throw together. And if you’ve been reading the blog for a little bit, you know how much I love coconut! I will definitely be trying more of the recipes from the Papa Kazmi Pure Cookbook, especially now that I have a spice rack filled with the right spices! If you’re curious about making Indian food at home, I would definitely recommend trying this cookbook.